Can Meesus TTP come up with some outstanding birthday ideas or what? 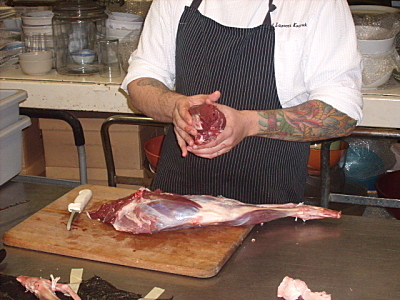 To celebrate my 46th, the Meesus signed us both up for an absolutely fabulous, 3-hour venison butchery and sausage-making class put on by Austin’s finest charcuterie specialists, the Kocurek Family Artisanal Charcuterie. Here’s a cut you’ll never get back as such (a beautiful roast) from your processor; that bad boy is usually turned in to ground meat. Too much trouble for the volume guys to mess with. For more on this fine class, check out my treatment of the subject, here. There was nothing slow about either of these movements; each was performed with a definite speed bias. “Dive Bomb” ab wheel roll-outs are initiated from a standing position, with a lunge forward (think sprint swim start) into the fully-extended roll-out, followed by a fast-as-humanly-possible snap back into a stand. Minimized knee-touch on the full extension as much as possible. Thursday, 11/18 – an hour-and-a-half in the fixie saddle; downtown ATX and Zilker park. Lots of gas in the legs, even following the tough lower-body workout on Wednesday. EZ bar nose-breaker (floor): 75 x 15; 105 x 10; 125 x 5; bar to just clear of the top of the head, plates just touch the ground on top-of-range extension. So the first question that might come to mind here is that of overtraining. My counter to that is, “look at the vast array of variance in methodologies employed”. Yes, my entire system is stressed to the max from each of these workouts, but in very, very different ways at each dosing. See my Conjugate for the Masses post for more on this thought. Intense each time out? You bet; variance, though, is key. And there I part ways with the HIT crowd: on the issue of training recovery time. HIT proponents tend (there are,of course, always exceptions — and I do consider myself to be a HIT aficionado) to view training response simply through the lens of Seyle’s General Adaptation Syndrome (GAS). However, many diverse bodily systems are stressed by intense training (and by intense “life events”, for that matter), and each of these various systems recover at different rates. Muscle protein synthesis, for example, has been shown to return to baseline within 48 hours, even following “intense training to failure”. So while the body’s musculature may be ready for another round 2 days following an intense hit, the cns (for example) may still be lagging below baseline. Now, “intensity” and “failure” are highly, highly n=1 determinative qualities; newbies, for example, are far from their ultimate potentials, and their capabilities are such that they cannot significantly disrupt (inroad) the cns and skeletal connective tissues in an exercise bout and can, in most every case I’ve seen, train again full-bore — and with the same methodology (i.e., no need to Conjugate) — with no more than 2 days between sessions. The more we advance in the iron game, however, the better we become (i.e., in a cns efficiency sense) at recruiting muscular motor units. We’ve also become stronger in a purely muscular sense (hypertrophy). We’re better able to harness and apply adequate intensity (both psychologically and physiologically). The end result is that we eventually come to the point where we do possess the ability to significantly stress the body’s joints, connective tissue and the cns in a single, intense bout of exercise. Now, recovery becomes more of a juggle, as these systems will typically require longer than a couple of days to fully recover so as to allow for the repeated, full demonstration of strength within the same methodology. Let’s not forget that if the cns and connective tissues (which contain sensory organs charged with the relay of information about joint integrity back to the central nervous system) says you’re not up to recruiting muscle fibers at full force (i.e. maximum rate coding) then it ain’t gonna happen; no way no how. The generalized HIT answer to this has been for the trainee to simply wait until (overall bodily) fully recovery has been established, without considering which aspects of the physiology really require that extra recovery time. The downfall to this approach is, of course, that muscular recovery (i.e., growth) is actually complete within approximately 48 hours of training; the balance of one’s recovery time is therefore devoted to cns and support structure recovery. For those interested in doing so, why not go ahead and stimulate the muscles again, though in ways that will spare the cns and support structures, yet tax the musculature in a novel way? Now, not everyone is all that interested in doing this, of course. Muscular hypertrophy and/or improved (explosive, power-driven) sporting performance in no way implies “hyper-health”, and it is my contention that all of the health benefits afforded those who strength train can be had by a single, weekly (and properly programmed and administered) 30-minute engagement. For those who choose to go above and beyond, though — from looking good nekkid to improved sporting performance — multiple, and highly intense (is there any other way to approach training?) — is possible so long as proper programming and recovery methods are adhered to. And don’t discount the absolute necessity of the “simple” things: adequate sleep, and the consumption of a Paleo diet. For a great treatment of this subject, check out Chris’ interview of HIT practitioner, and high-level competitive cyclist, Patrick Diver. Patrick has the n=1 application of a HIT-like protocol for endurance athletes nailed. Prescribing the proper dosing, frequency and methodology of strength training applicable to each individual’s n=1 needs is the true art of the Strength and Conditioning profession. Interesting discussion at the end there. It’s actually starting to sound a lot like the Doggcrap Method. Not sure how much you know about his methodology, but as I understand it, he basically talks about training to failure once every three days, on a 9 day rotation in which you’re using different exercises to stimulate similar muscle groups. If your muscles are fully recovered despite the CNS and connective tissue needing more time, it would be a compelling argument for training in such a fashion. Absolutely, Geoff. DC training is, in my opinion, about as close to a “perfect” generalized program as you can find. I’d venture to guess that the DC methodology forms about 60% of my overall programming methodology underpinning, with the balance tweaked to my n=1 goals, needs, “life situation”, and abilities. Like “Paleo”, the goofy name obscures the beautify and relevance of the system.